Located in the quiet town of Ljubitovica, this villa is the perfect choice for a relaxing holiday away from city noise. Villa Stara Kula has two bedrooms and a bathroom, as well as a fully equipped kitchen. You can also find a nicely decorated dining area, both on the inside and outside. 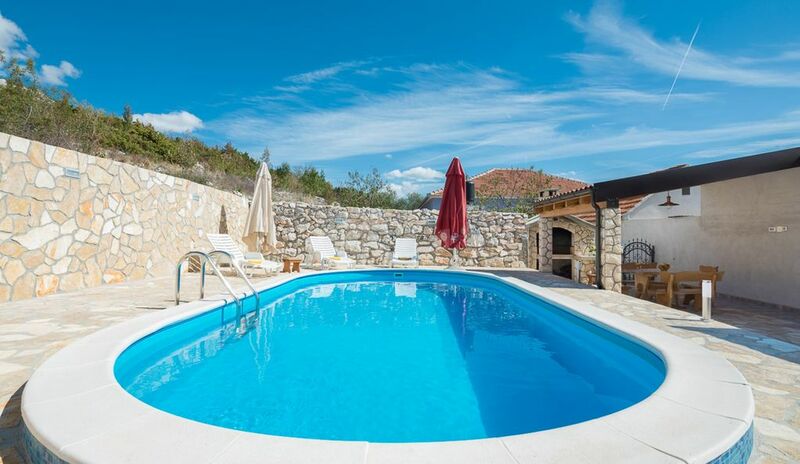 Enjoy summer in Croatia on a spacious yard with family and friends, barbecue and cooling in the private pool. This was advertised as 3 bedrooms - not true, third bedroom was the lounge? ?- we were 2 adults and 2 children, yet could not all seat on the sofa and had to use the dining chair too. The bunk beds were located in the incredibly tiny bedroom that when the window was opened they would hit their head on it for lack of moving space. The china and cutlery was abysmal - I had to go out and buy a kitchen knife as the only sharp knife provided was a bread knife. There was no teaspoons and other items that you would find in a well stocked kitchen. The hot water would regularly run out and in the end the children would use the outside shower - so again how did they think they could accommodate 6 people? To make matters worse when it came to returning the deposit - the owners did not turn up and I had to chase, when they finally turned it was clear they didn't want to return the money and found fault with the pool (chlorine tablets that turned up at the bottom of the pool) and would cost to repair. When I threatened to go to the police they returned the deposit. A very poor service indeed.